Are you melting where you are? We are melting, but I sure love this hot weather in Seattle. It’s funny how we complain when we don’t have the sun, and we complain when we have too much sun…or maybe that’s just me? Yep, definitely me. When it cooled off in my sewing room I finished up this top, a crib size made from my Lucky pattern. The original pattern has an all white background, but with this one I used various neutral prints and it makes a great secondary zig zag pattern. Wouldn’t it be cool to make the background bright and the blocks neutral? Adding it to my mental to-sew list that I’ll never actually make. 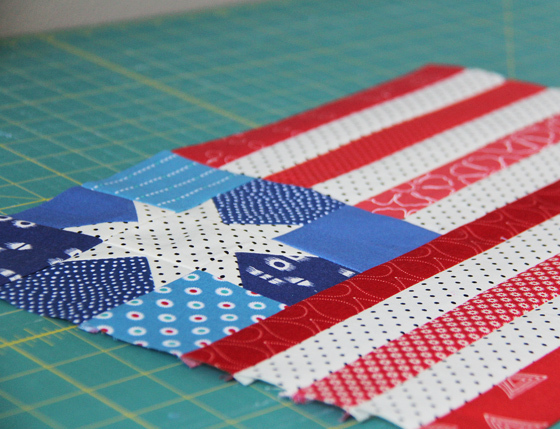 Last night I stayed up late making a flag block for no reason. For a split second I thought about attempting a flag quilt, but now I’m thinking a pillow for my porch sounds much better (and easier). Stay cool! How did you quilt your top here? I see some lines. Did you do that all over? I'm having a hard time with white backgrounds and pretty squares. 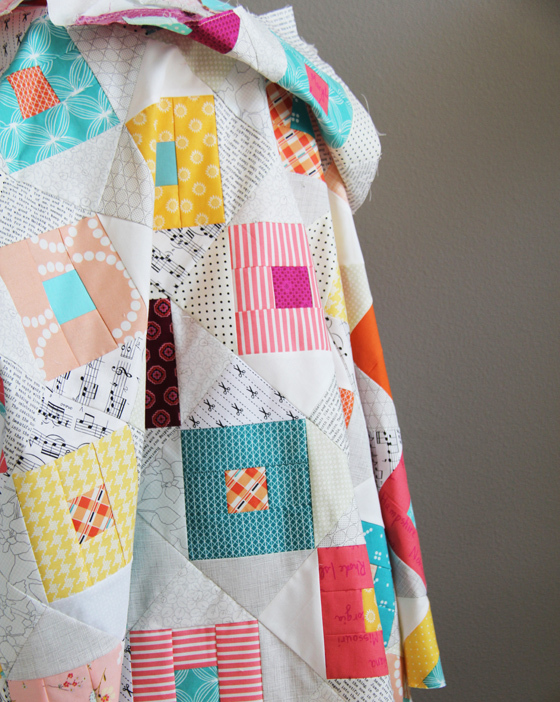 Your Wallflowers quilt is an example. I ended up doing some quilt in a ditch and then did some machine embroidery in some of the white spaces. I'm going to get a long arm I guess. I love the process of sewing but the quilting is a challenge. I love your patterns and will buy this one soon. Thank you for your wonderful patterns. Allison. I wish you could put you creativity in a pill and give it out to all of us who love your work! I have followed you from your early days and everything you do is so beautiful! And inspiring! I can't wait to make this quilt ! Thanks so much for taking rather time out of your busy life to share your work! And being a grandmother I have to add…your children are adorable ! Happy summer sewing! Come to NC sometime! You do great work. Love both pieces! I love that flag block ! I think I will make one too. I love your crib quilt! Complaining about the weather? NO, it isn't just you, it is a great way to vent and harms no one! I love the flag block. Is there any way you can do a tutorial or pattern or tell me where you got your pattern from. That is a beautiful top and the flag is great too. Sometimes we just need to make something! Love 'em both! I love this pattern and it looks super happy and fun! This would be way cute for fussy cutting too! Very nice top! Isn't it amazing how nice something so very simple can be? Those very basic blocks – I'm not even sure what to call them, square in a square? Or courthouse steps? – and a neutral background. It doesn't get much simpler than that. I'm really finding myself very drawn to the "modern" neutral backgrounds, especially the ones which are actually scrappy like yours is here. Just love that. I made a very similar quilt myself recently, but didn't set my blocks on point.. And I'm already trying to figure out when and how I'll make my next one! Might very well end up doing it with one of your patterns! Beautiful quilt top and flag block. Thank you for sharing your talents with those of use whose talent is in borrowing the patterns and tutorials of others. Not everyone can do that, so I'm happy that you can! Love the crib quilt. Great colors. Here in WI we are experiencing rather unusual cool temps. Mornings are 45° and highs of 75°. Brrr. Love "Summer Lucky" – especially the variety of the backgrounds. I have scads of them….this is a perfect excuse to start using them. And that flag top…..very cute! Happy 4th! I love your quilt! I think the colors are really striking and gorgeous and I love the interest that the variety of the low volume fabrics in the background provide. And this is me complaining about the weather. By the way, I live somewhere fairly close to you. Let's move out of Texas we said. We can finally move to the beautiful Pacific Northwest we said. We'll get out of this H-hole heat we said. It will be fun! we said. Hahaha! Our friends could say. You did move out! But it wasn't out of the heat.You moved out of the air conditioning! Sigh. My husband and I applaud the intelligence and kind heart of our new state except in this one area. No air conditioning. Arrrgh! It's torture! I'm down here near Portland, so I know exactly what you mean about the weather–maybe its the humidity that comes with the heat, yuck! The quilt is lovely, soft but summery sherbets. 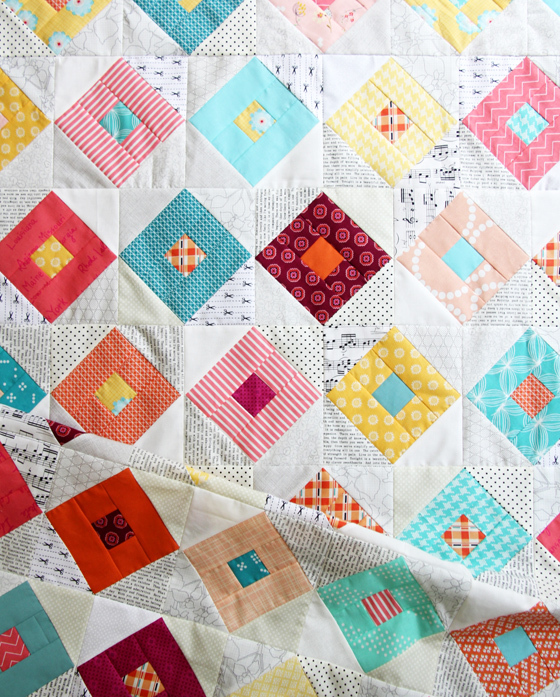 I'm loving all these quilts using low volume prints, I've got to get me some and make one! I love the fabrics you choose.